After reading “Why Successful People Never Bring Smartphones Into Meetings” in Forbes, by Kevin Kruse, you may be interested in downloading his Smartphone Free Zone sign. This PDF file is designed in color and ready to print on standard letter size paper. Display this no cell phone sign in your conference room to keep your meetings quiet, and your participants focused. 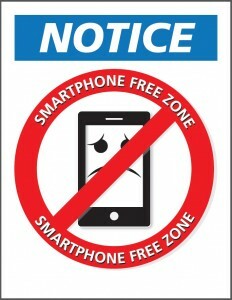 Click here to download the Smartphone Free Zone sign. AND, don’t forget to subscribe to Kevin Kruse’s newsletter to get more leadership tips and articles on business excellence.